Symmetry I - metal sculpture puzzle hand finished and imported from America (this puzzle normally takes several weeks to be delivered). 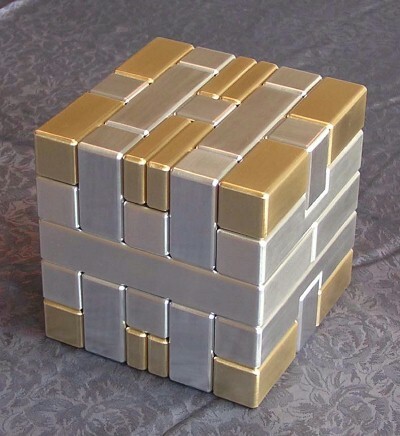 When fully assembled, Symmetry I forms a two tone, four inch solid metal cube weighing 7+ pounds! This is a limited edition; each sculpture is dated and numbered. A certification of authenticity, the special key and assembly information are included with each sculpture. Symmetry I comes ready to assemble! Shipping boxes have an individual compartment for each piece to prevent any damage during shipping. The puzzle was designed by GarE Maxton and this is the most affordable of the puzzle sculptures he produces. This sculpture was designed with twenty interlocking elements made from brass and aluminum. Each piece by itself is an interesting geometric form with a wonderfully smooth feel. Every piece of every puzzle is meticulously finished and tested for a smooth sliding, interlocking fit, then individually sanded - giving each piece its signature rounded edges and the beautiful brushed finish you see here. The finished work has an luxurious "fit and feel." Included in the design is a locking mechanism that keeps this weighty piece intact when picked up and/or turned over - meaning it will not come apart without a key. With the simple key (included), you can easily unlock this intriguing puzzle to take it apart.